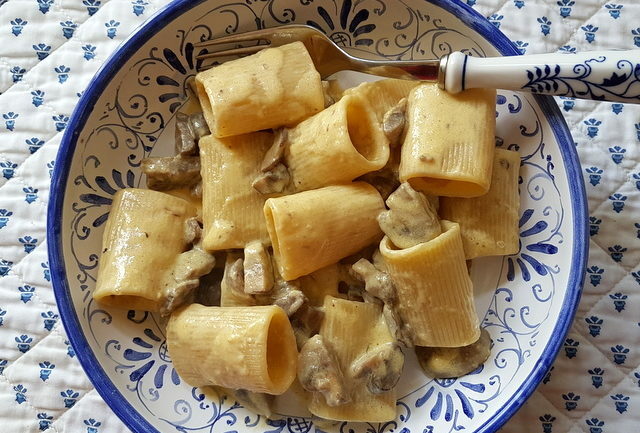 Paccheri; its origins, history and recipes. 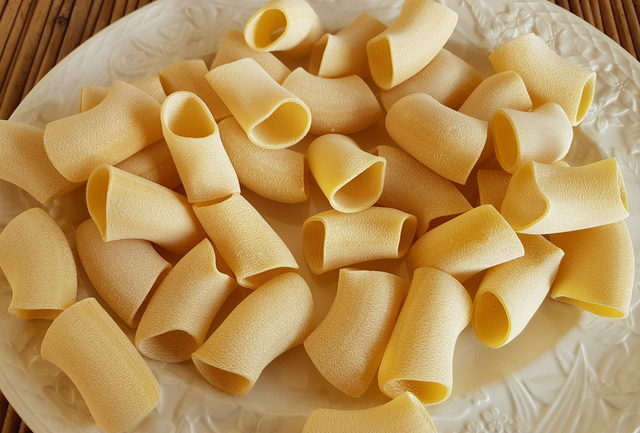 Paccheri is a traditional Neapolitan pasta which look like giant macaroni or, as some say, pieces of a cut-up garden hose! Generally made with durum wheat semolina, it is usually served with rich heavier sauces or seafood. It is also very often stuffed with ricotta or other ingredients and baked. The word paccheri apparently actually comes from the ancient greek (“πας” -all and “χειρ” -hand) which is still used in the Italian language to mean a pat or a slap given with an open hand, but not in an aggressive way. Many attribute the name to the noise made when pouring sauce onto the pasta, which in Italian is described as resembling a ‘schiaffo’ or in Neopolitan dialect ‘una pacca’, which also means a slap. 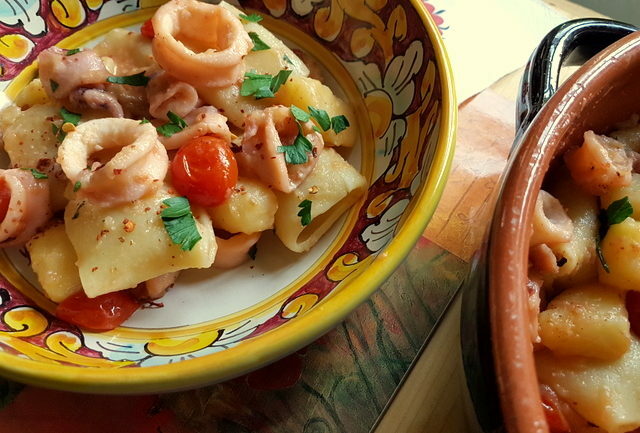 In Neapolitan cuisine, paccheri has pretty ancient origins and has been around for a long time. 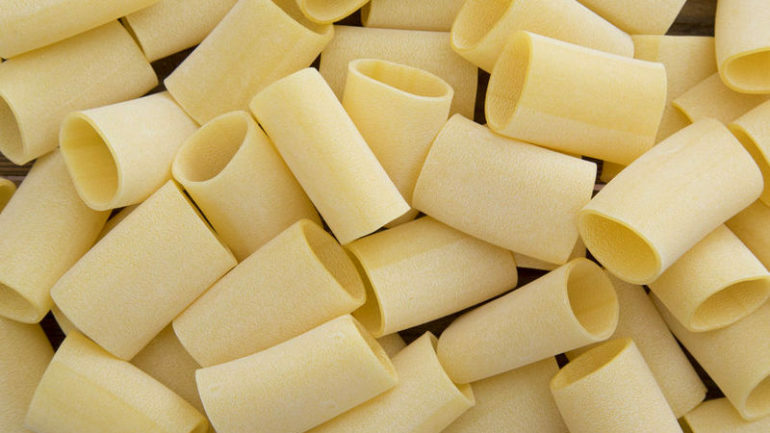 In the past, it was considered ‘poor pasta’ or pasta for the poor because the pieces are very large and filling and so appetites could be satisfied with only a small quantity of pasta and for a very low cost, as it is actually made with only flour and water! 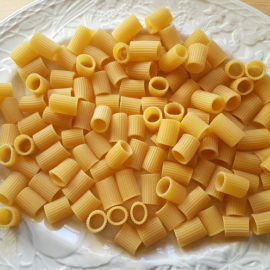 The pasta that was used for smuggling garlic! Paccheri pasta has one of the most interesting origins I have come across in my pasta history research! I have read that its invention was, in fact, a way to smuggle banned garlic cloves across the alps into what is Austria today. Apparently, Prussian garlic (Austria was called Prussia in those days) was rather small and not very pungent. In contrast, Southern Italian garlic, with its large pungent cloves, was sought after by the Prussian and Hungarian aristocracy. In the early 1600s, in order to protect their own garlic farmers, the Prussians banned the importation of Italian garlic. Southern Italian garlic farmers, whose livelihood depended heavily on the Prussian Garlic market, were more than upset. 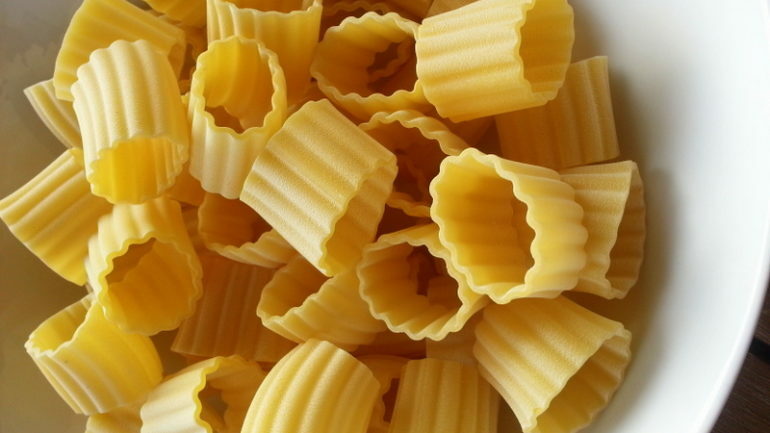 Food history tells us that Southern Italian pasta makers secretly invented paccheri pasta to be perfectly shaped to hide a ducat’s worth of Italian garlic (approx.four cloves). This garlic smuggling operation was so effective that, in the early 1800s, the Prussian garlic industry finally collapsed. The Prussian government had not been able to find out how Italian garlic was being smuggled across the alps so effectively or stop it! Funnily enough many dishes made with paccheri do tend to be very garlicky, maybe because of the pasta’s garlicky history!. This pasta is often stuffed with sausage and garlic and topped with a red sauce. It is also stuffed with porcini mushrooms and served with a garlic flavored white wine sauce. Whichever way it is cooked, recipes made with paccheri are definitely hearty! They also often include a thick meat ragu or bolognese. 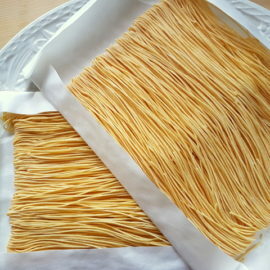 Many Italians also use paccheri in a sort of lasagna-style dish. 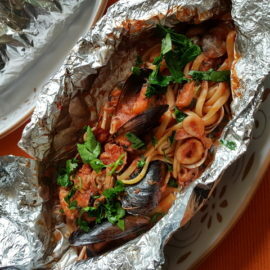 The pasta is filled with ricotta and then layered in an oven dish with tomato sauce and Parmigiano cheese before baking. Another popular and delicious way to cook this pasta is with eggplant and dry ricotta cheese! 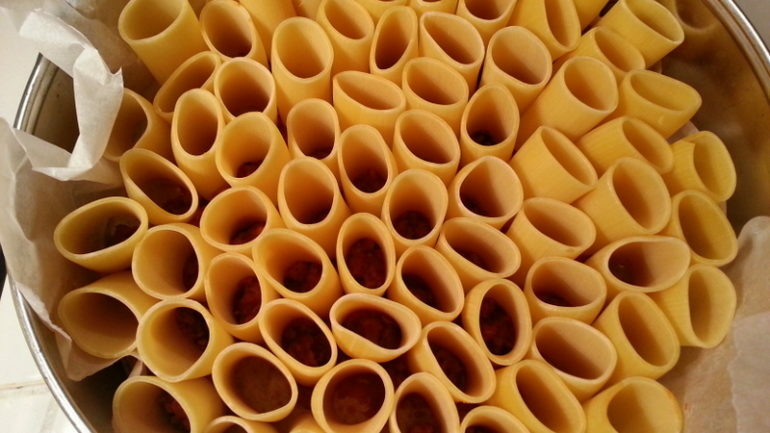 In Italy, there are some different types/sizes of paccheri. Mezzi paccheri are half the size of the traditional ones. Both rigati ‘grooved’ and lisci ‘smooth’ versions are available. As far as I know, this pasta is now quite easy to find outside of Italy. So, if you haven’t cooked with it before, now’s the time to do so! 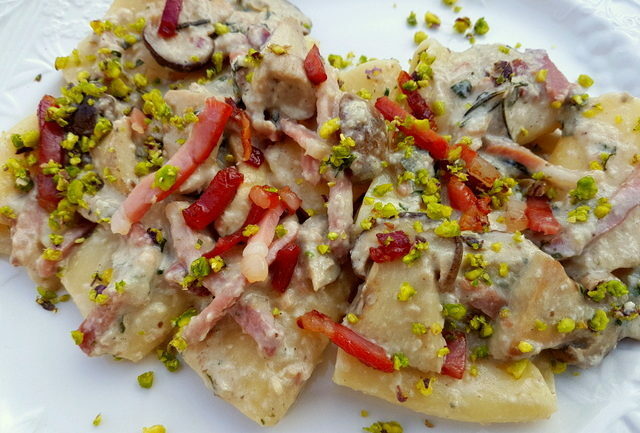 I have already posted a recipe from Puglia for baked pasta alla Tranese with mezzi paccheri rigati and another one with porcini, speck and pistachios. 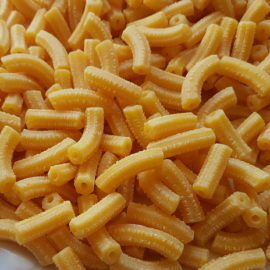 I plan to post many more with this pasta as I continue my journey through the wonderful world of Italian pasta! You can also use paccheri in recipes for similar pastas. Here are some recipes which would work well with paccheri too..
Fusilli pasta with tomatoes, basil and burrata cream. Thanks very much. Really interesting history. I looked this pasta up as my local department store in Helsinki started stocking paccheri recently. My 10 year old suggested a sausage, bacon, garlic and cream/egg sauce. I added some white truffle oil. Probably sacrilege for Italians but I just can’t follow recipes and always cook off the top of my head. Anyway, at least we liked it, and I think the thick rich sauce worked pretty well. Interesting that we put lots of garlic in it (before reading your article)!